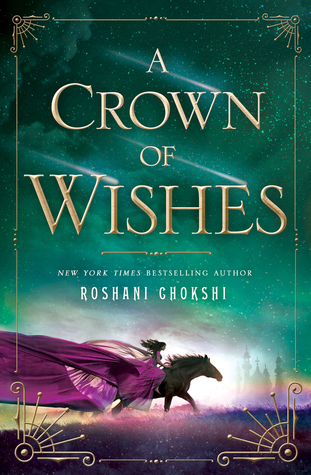 A Crown of Wishes by Roshani Chokshi. Chivalry demanded that he should inquire after the Princess’s well-being. Then again, when the princess in question had tried to kill him and probably would try again the next chance she got, perhaps chivalry should be ignored. There is a very vocal part of me that is also very susceptible to catching the travel bug. And whenever I can’t actually go I can at least comfort myself with imaginary travel. This weekend I packed my bags and off to not-quite-India I went. This is the second book set in this universe, but reading The Star-Touched Queen is not entirely necessary to understand this one. It makes you appreciate certain scenes and references more and would be spoiling to an extent to read the other way around, but apart from that, they are independent. The two protagonists are more or less polar opposites in their character and outlook, but they, in essence, share the deep desire to be acknowledged and remembered. I loved how Gauri is the fighter with smarts while Vikram in the clever thinker with faith. They are, of course, perfect partners to compete in the most fantastical tournament which offers the most unreal prize as it is limited only by the winners’ imaginations: a wish. This has its own double-edged blade quality, as you might imagine, especially if the judge of the tournament is a god who makes up the rules as he sees fit. A rich and deep narrative with just the right amount of mystery and humour that will have you wishing for sumptuous meals and luxurious clothing while at the same time challenge you to outfox the smaller and bigger riddles and quests. I could have stayed in this world a while longer to savour all its wonder and sights. But the story is well-rounded and told in exactly the manner it called for, even if I’m going to have a hard time to let these characters go. Do you have a preferred travel destination, imaginary or otherwise? Share them and your teasers in the comments.